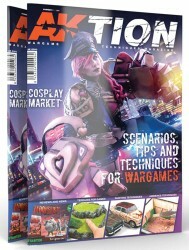 "- 86 page full colour quality glossy mag. Scenarios, tips & Techniques for wargames. Inc Customising MDF buildings,painting vehicles, making hills, statue effects etc and scenarios for KINGS OF WAR; FIGHTING SAIL: HONOURS OF WAR: & BOLT ACTION"